A fine beer, i) is made from traditional ingredients and not heavily processed, and ii) has an excellent flavour. Craft productions do not occupy all the space here. Blonde lager made by old-established companies can be superlative too. European lagers in particular have set the pace for quality since pale lager took root in Pilsen, Czech Republic in 1842. But you have to get the right beers, and at their best. In the early days of the craft brewing era, some names in Europe were highly reputed for lager. The most famous was and still is Pilsner Urquell. Another was Grolsch from Holland, which had a top reputation for its all-malt recipe and lack of any form of pasteurization. Another beer well-reputed was Stiegl Gold of Salzburg, Austria. Recently I had these in a flight – a serving of about 4 oz each – at the Loose Moose downtown in Toronto. Unlike on most previous occasions when tasting these anywhere, each was nigh on perfect. This means: the beer was well-brewed, it was very fresh, and served in very clean glassware. It may sound odd to say that brands such as these made for generations can be brewed differently or taste different but I’m convinced this can occur. Brewing processes change, sometimes subtly but they do, ingredients certainly change especially the availability of some hops, and of course the age of a particular barrel and how it was treated before beer hits your glass can vary quite a bit. Sometimes conditions contrive to make the perfect taste though, as the other day at Loose Moose. 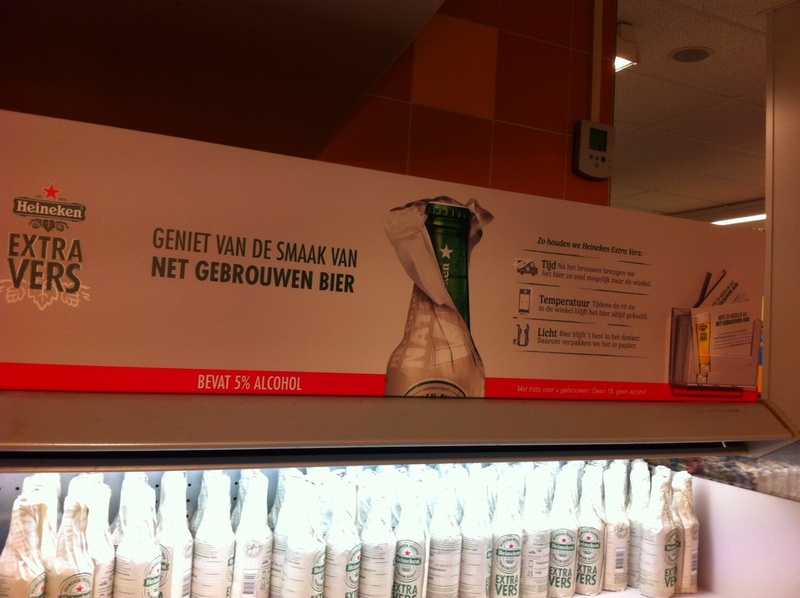 The Grolsch had no grassy skunky notes. I’ve often noticed this taste before, and I don’t think it comes (usually) from the green bottle as I’ve noticed it in the canned version too. I believe it is a dimethyl sulfide note (DMS), that typical boiled onion taste so many Euro lagers have, and which many people like evidently. I am hoping either that the draft is made a little differently than the bottled stuff or the lab people at SAB Miller are seeking to rub out the taste. (If they are, keep going team, you’re on the right track). The result was a dryish, clean malty taste with some good neutral-type hops underneath in support. Not a strong taste but a good one. I’d rather have a fine but restrained taste than bags of flavours which don’t cohere or taste right. Stiegl was more hoppy and a little heavier in body with a fine apple note from the yeast surely. It was spicy in the best German way but with no DMS, no chemical/chlorine taste as numerous other German imports seem to have, perhaps from overage or deterioration to heat. 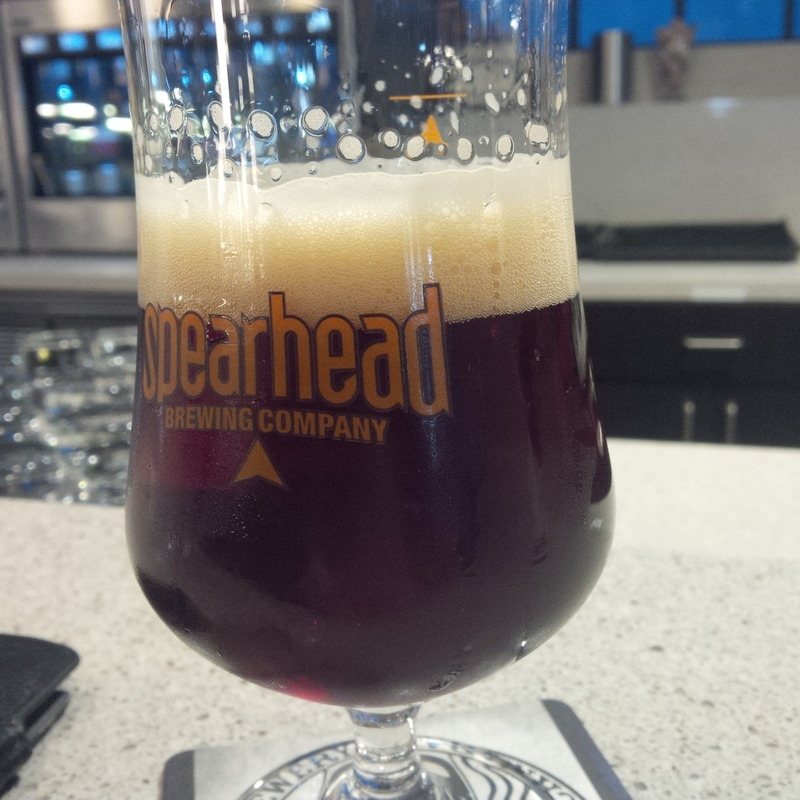 The Urquell was winy-like, with an insistent hop presence and the slight rye bread note the beer usually has. But the balance and freshness were better than I’ve had from cans or bottles recently, and well, it’s just the right taste. It reminded me of very fresh Urquell in NYC where the turnover is high and after all NYC is the first landing in from the Atlantic. (Still, it can be indifferent in New York too). When European lager is as good as these, it easily matches the best top-fermentation beers of England or Belgium, and now too North America which does a good turn in pale ale and India pales. Some unconnected thoughts that nonetheless encapsulate in toto my specific approach to beer, pubs and other things bibulous. First, I note with bemusement the febrile rivers of bandwidth still being devoted to big brewery takeovers of craft operations. The angst seems always present even when the opposite posture is proferred. I was there at the beginning and can say the goal was to get good beer. Many large or old-established regional breweries then, especially in England, Belgium and Germany, made great beer. Guinness (bottled) was great then. No one was concerned as such with how large a brewery was. No one would suggest, say, that Courage Directors or Ind Coope’s Burton Ale were anything but world-league beers. 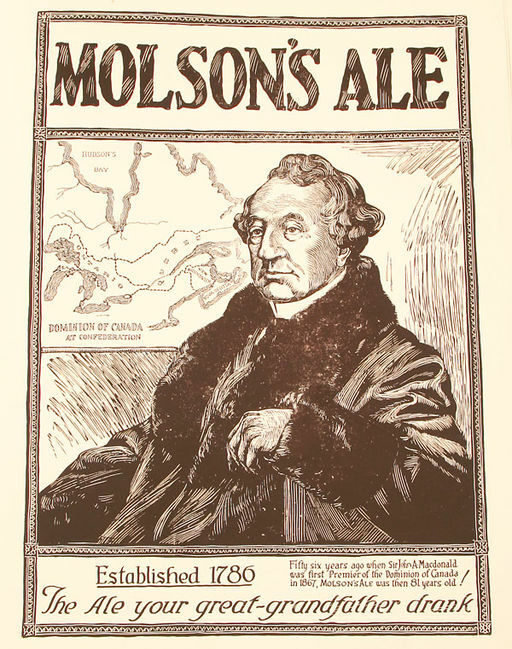 The problem was that breweries in North America had consolidated to the point where light-bodied beer was a firmly-held mantra, culmination of a decades-long process. 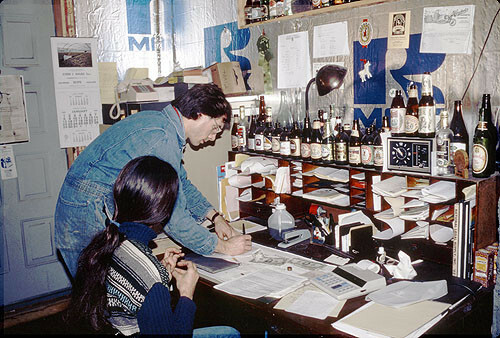 The small is beautiful mantra came later as a spin-off from the beer revival movement. While valid unto itself, it was never the only model for good beer, nor could this really be possible as new entrants often lack the skills and palate experience to make fine beer. The widespread availability of fine beer in a range of styles has now been fully addressed since 1980. This was due to the landmark efforts of Michael Jackson, Ken Grossman, Fritz Maytag, Charlie Papazian, Bert Grant, John Sleeman, and many others. In a word, they made large brewers take notice. The growing tide finally convinced the megas they were behind the times, to the point some well-known small breweries are being bought up; that’s good. (And it’s not entirely a new phenomenon either, it started almost as soon as the craft breweries did. Its acceleration simply speaks to the slow but certain acceptance of quality beer by the market at large, or enough of it to make a difference). There is every reason to think big brewers will continue the quality standards the small units bought out made their reputation on. Except for the Bud Light type of beer, and also certain imports such as Corona and Heineken which have an inherent status in the eyes of many, the future is in full-flavoured beers. Big brewers know this. We’ve won, and if any doubt persists, there are lots of existing and upcoming breweries to keep the big fellas honest. If they change Goose Island IPA, say or Mill St Tankhouse Ale, lots of hungry breweries will take up the slack. The issue is done as dinner as far as I’m concerned, and I hope the beer press leaves it alone except to note clinically the further buy-outs as they occur. Best beers of 2015? For me, Germany’s DAB Dark with its velvet, molasses-like palate, very stable in the can and showing the true qualities of Bavarian dark lager albeit from Dortmund. In Toronto: Amsterdam Brewery’s Autumn Hop Harvest Ale, which used fresh (unkilned) hops from an Ontario farm. The vivid qualities of these hops surely evoke the kind of beer made in the distant era when hop culture and processing were a local, non-standardized business. I must also mention Bellwood’s Cat Lady IPA, which I discussed in posting a few months ago. In New York, the collaboration brewing of Tres Equis by Threes Brewing and Other Half set a new standard for a broadly Czech-type pale lager as far as I’m concerned. And I must say my re-acquaintance with the venerable Molson Stock Ale was pleasing. It has a full flavour with an insistent hop quality I can only call “nervous”, in the sense that is used to describe certain French white wines. (See the definition of nervous in wine-speak here for those not familiar with the term). 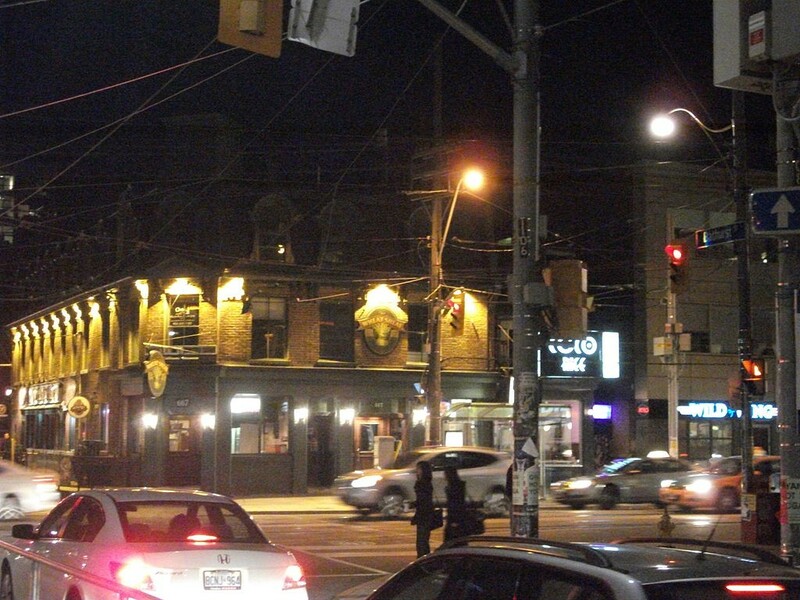 Most interesting Toronto beer bar? As always, Bar Volo due to its ever-changing and imaginative selection and sympa service as well as its connections to the ineffable Cask Days. Other bars appreciated were Dora Keogh, the Wallace, the Granite, the Wheatsheaf, and Cork’s Wine and Beer Bar (Laird St. location). Each offered something different, not least a personal touch from the owners or staff. When a dram of whiskey is wanted, this year Tennessee’s Jack Daniel Single Barrel impressed a lot. 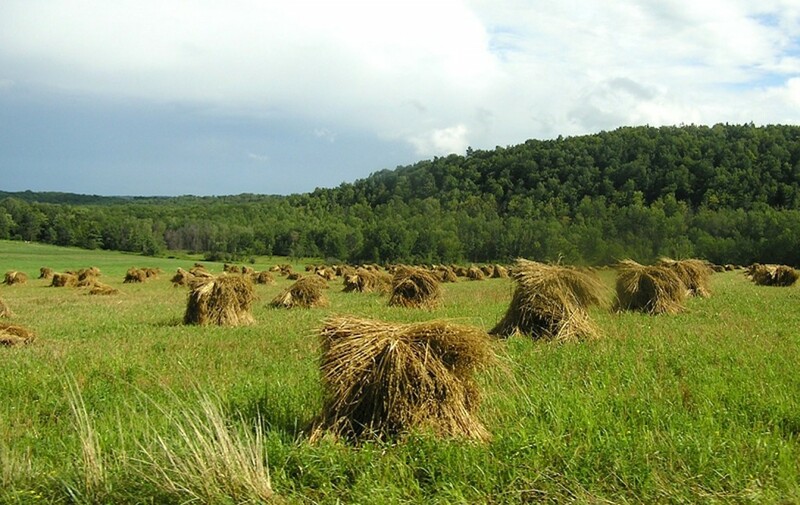 There is an ever-increasing range too of excellent Canadian whiskies, tangy with the mint or spice of rye grain sheathed in sweet barrel gums. Alberta Springs Dark Horse, Canadian Club Chairman’s Select 100% Rye and Gooderham & Worts Four Grain would surely rank in most peoples’ top 10. In wine, Ontario Niagara sparklers are surely at a peak of quality, especially Tawse’s and 13th Street’s, also Henry of Pelham’s and in general riesling from that area. A number of assemblages of reds put together by skilled craftsmen/vintners in the VQA genre made a statement too. And did you see I didn’t mention icewine…? We live in the best of all possible times for quality beer, wine and spirits in Ontario – it will only get better. Alan in Holland suggested I write some thoughts on brown ale, a category he always found somewhat unclear. His perception actually accords with the beer’s place in brewing and beer history. Although if you look closely enough, the general pattern emerges. First (in Britain’s primal communities) there was ale – fermented barley malt, probably not boiled, no hops, although sometimes flavoured with herbs or spices. A sweetish, bready drink (probably), with little shelf-life. Later came beer proper, inherited from Holland and the other Low Countries when the Dutch and Flemings migrated to Suffolk and other eastern parts, mid-1500’s. This was an infusion of malted barley, and sometimes other grains, boiled with the resinous flowers of the hop vine and then fermented. Beer kept better than ale due to the preservative and ascorbic qualities of the hop. For a long time, ale and beer co-existed although in time even ale used hops, but less than for beer. For colour, ale was generally light-coloured, beer was darker and approaching to black in the case of porter and stout. Porter and stout were always beers, not ales although both are top-fermented vs. the sedimentary fermentation of lager. However, this scheme was never airtight. 1700’s brewing manuals give recipes for both pale and brown season beers – beers laid down to mature and protected by their higher content of hops. Conversely, there are Georgian recipes for common – not 1800’s – pale ale and brown ones, including a strong ale called “stitch”, probably linked to the expression to be stitched up, still understood in Britain. Thus, by the 1700’s, both beer and ale could be brown or pale or indeed amber. The really important distinction was in terms of hop levels. For much of the 1800’s, beer was well-understood: it was a decidedly bitter drink of porter, stout, or India Pale Ale – confusingly, IPA was beer not ale despite the moniker. True ale could be mild (new) or aged and if aged it had more hops than mild ale, but all things equal ale was on the sweet or at least non-bitter side. An ale meant for keeping (aging) always had less hops than a beer of the same strength, approximately half according to the researches of beer historian Ron Pattinson. Today, most beer in my opinion is actually ale except for the most bitter examples of IPA and stout, and the reason is that hop levels today are far lower than in the 1800’s. In effect ale and beer have merged and you can have colours of each in any hue and of any strength. Nonetheless the old distinction lingers in that England’s “pint of mild” where you can still get it is almost always less bitter than a brewery’s “pint of bitter” aka pale ale aka India Pale Ale, the meanings are synonymous. Brown ale seems to have declined by the end of the 1700’s, as porter and stout rose in appreciation that is. This was probably due to the more complex palate and evolved flavour of the black beers. The odd brown ale was still made though through the 1800’s, and the type resurged in the 1900’s, generally as a bottled beer. Newcastle Brown Ale is or was famous as a brown ale type, and there were sweeter ones such as Mann’s Brown Ale, still made I believe. I would think 1700’s brown ale had a somewhat smoky taste due to being made, as porter was, from all-brown malt then. 20th century brown ale does not have that taste. The keynote signature is a caramel mildness, but each brewer had/has his own take. Today craft brewers make all manner of browns so that stylistically it is impossible to classify them easily. If one can generalize at all, brown ales are usually not highly hopped, and in this sense reflect the lesser-hopped quality ale had traditionally. History’s hand can be seen at work, albeit one must peer to discern the outline and with the benefit of some historical study. Jack Daniel’s in recent years, the famed Tennessee Whiskey that is bourbon-like but eschews the word bourbon, has gotten better. It went through a period until about seven or eight years ago when the whiskey seemed unbalanced with an acerbic banana/acetone flavour. This is all in the past now and I think it is simply the result of better batch preparation: the mingling of the barrels seems to get more attention. 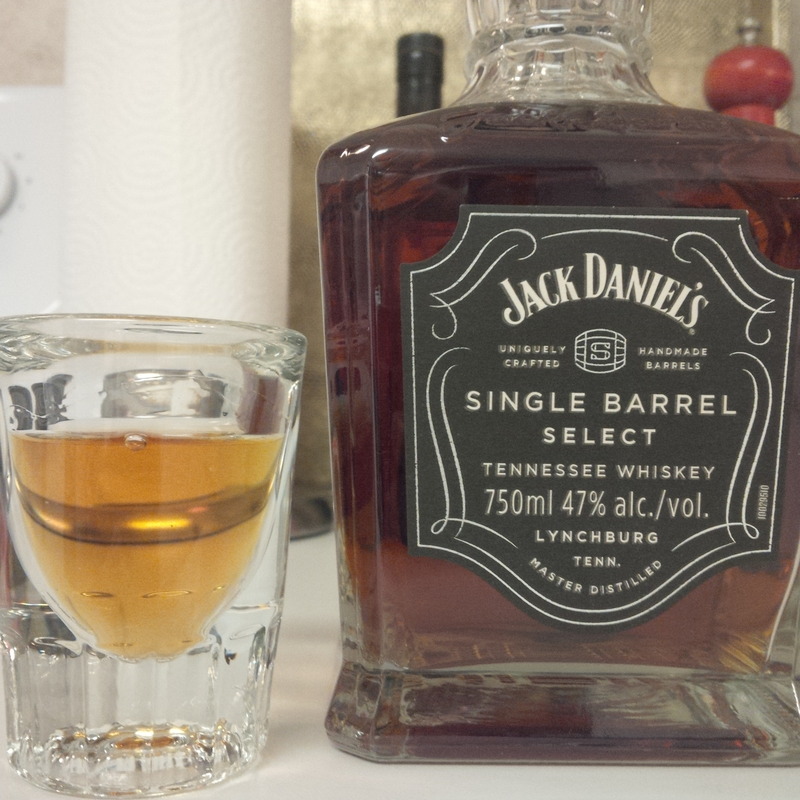 Regular Jack Daniel is on the sweet side, sometimes still with a banana or other yellow fruit note, but the whisky, even at the current 40% ABV (save special releases) is almost always very sound, whiskey which can stand up and then some to the Kentucky bourbon. Indeed today when long-aged bourbon is at a premium, Jack even at its 4-5 years of age is a good value. But where things really ramp up at the House of Jack is the single barrel version. 10 years ago or so these were higher-alcohol versions of regular Jack and while selected from one barrel, as today, they didn’t offer anything really different. That was then. In the last few years, the single barrels show a demonstrably higher quality, or in my opinion they do. Each bottling, too, is different: some more woody, some more sweet or ashy, some with the trademark Bananas Foster note, and some with no banana esters at all. This reflects the peculiarities of each barrel and its position on the rack in the warehouse. The weather too each year is different. In the result, the “honey barrels” as they are called, aged in the top (hotter) portion of the warehouse, each end by being a different “vintage”. The one pictured above, bottled in August of this year, is a virtually perfect Jack. It is viscous, slightly sweet, with a minty/fudge/campfire flavour. Very smooth on the tongue too for something almost half ethanol alcohol. A fine malt, fine Canadian and fine American whiskey are typically quite different. Jack is a pure American expression of the whiskey-maker’s art. You can see behind it the British influences which the Scots and Scots-Irish brought to Appalachia and environs. I think the charred barrel smoky notes may have been intended to replicate Islay and Ulster whisky of the 1700’s which used peated malt. The grain bill of an American straight – generally corn, rye, barley malt – is kind of like an Irish single pot still approach in that a good part of the mash derives from unmalted grains. But no Irish whiskey, no Scots malt, tastes anything like a honeyed, slightly charcoal and wintergreen shot of American whiskey. The warm climates of Kentucky and Tennessee have something to do with that. And the Tennessee straight style adds that week of percolation through a stack of maple charcoal before the “white dog” (new whiskey) is barrelled for aging. The maple charcoal treatment, a vestige of a 19th century whiskey “cleansing” process, adds the final fillip to the legend that is Jack. Anyway, words can’t do it justice, but we have to try. A few drops of Jack SB make the words flow better, I declare. Many, perhaps most reading can claim more connection to Christmas than I. Still, they must be wondering, “what is ‘Spiced Beef for Christmas’, exactly?”. In England in past centuries a special dish was reserved for this season: a cured and spiced round, leg, or chest of beef. It was prepared in manor houses or prosperous farms. 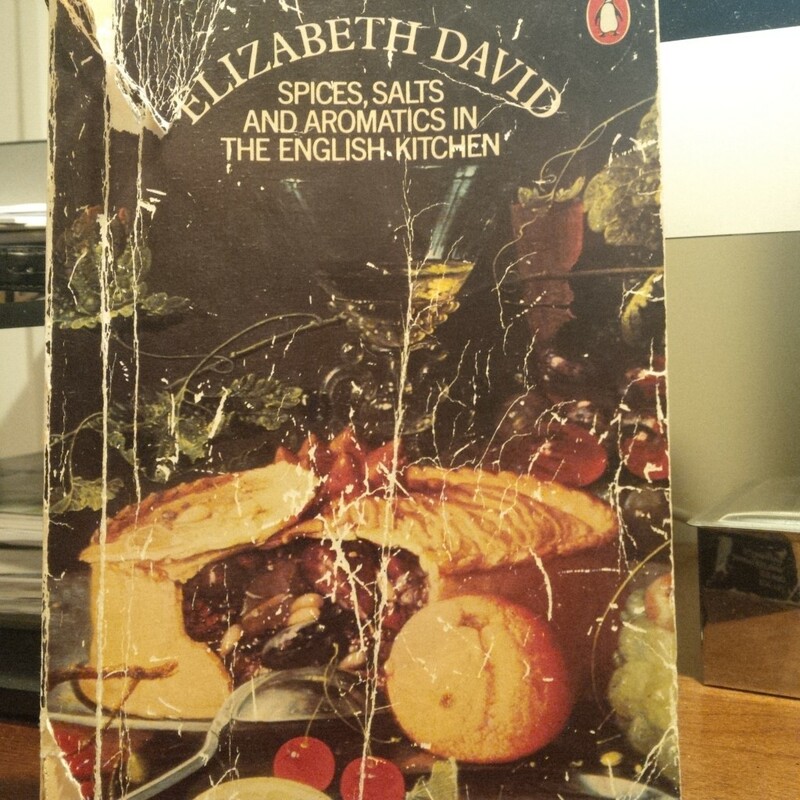 The great British culinary writer Elizabeth David devotes almost three pages to it in her classic work on English cookery, Spices, Salts and Aromatics in the English Kitchen (Penguin, 1970). She explains that the dish was largely forgotten in the London of her day. Intent to restore interest in this old specialty, she told “Mr. Ducat”, the “master-butcher and creator of the famous French boucherie at Harrod’s”, that she would publish a recipe in the Christmas 1958 issue of Vogue. Hearing this, he suggested he make the spiced beef as a special Christmas offering for the Harrod’s Food Halls. He did so with her help, and it was an immediate success. By 1970 Harrod’s was selling thousands of pounds a year. Spiced beef is scarlet-coloured and best prepared in a large joint, as the British would say. A minimum 20 lbs was deployed in the old days. 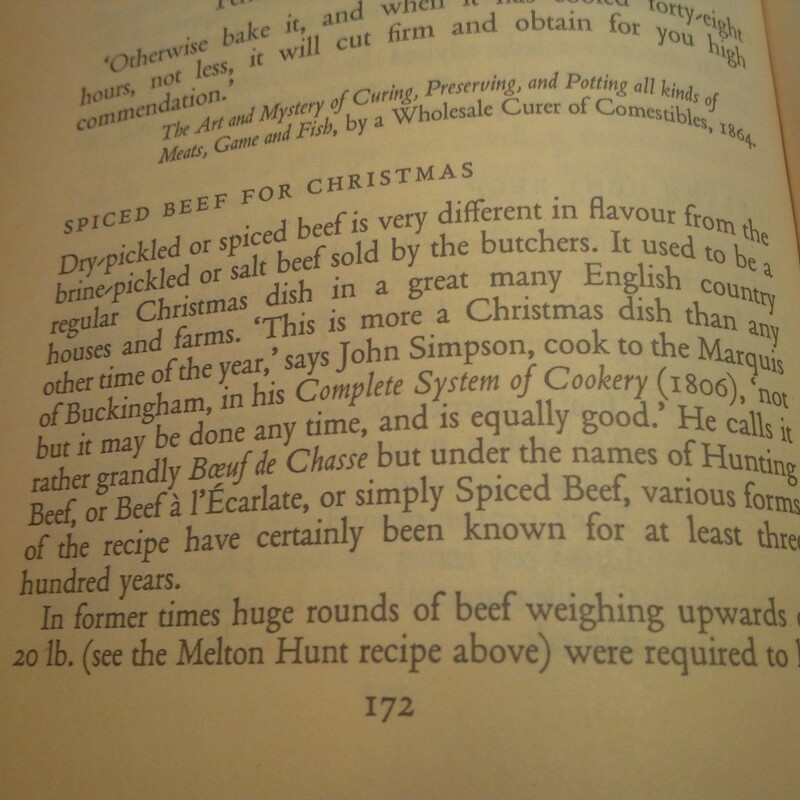 Spiced beef was intended as a set piece on a table featuring other festive dishes such as roast goose with chestnut stuffing, roast turkey or sirloin of beef, baked apple, mince pudding or pie, and baked ham. Elizabeth David’s lengthy elucidation of the dish is a sign of her respect for, and deep interest in ancestral foods. She specifies that the beef must be dry-cured vs. brined, and that the character of the beef is vitally different as a result. She specifies that the meat must lie in dry pickle upwards of a month. She states that properly prepared the dish gives some indication of the type of food eaten centuries ago. It’s a kind of vintage ham, a venerable country specialty made by those who could afford the best butcher’s meat to gladden the season. When I moved to Toronto 30 years ago a number of small butchers still offered it at Christmas. Often the full leg or other cut would be displayed in the window with the legend “Christmas beef” or “spiced beef” affixed. Seeing this I wondered what the taste was like and how it was served. 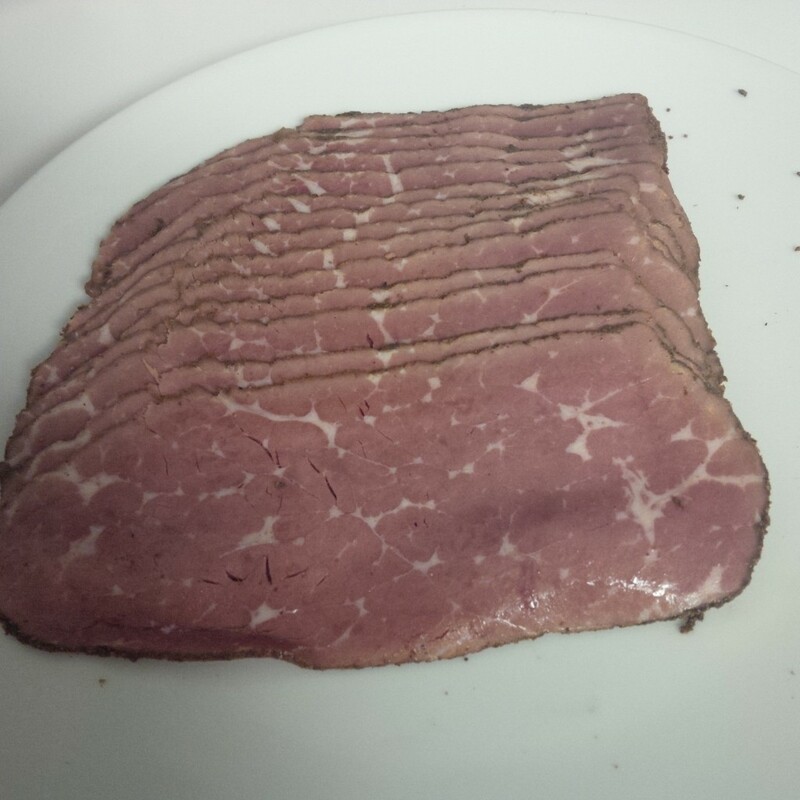 I’m from a tradition that takes pride in its corned beef and smoked meat or pastrami. So I was puzzled so few Anglo-Canadians took an interest in their equivalent. I knew about Irish or east end London boiled or corned beef cooked with cabbage or carrots, but this seemed different. I mustered the courage to buy some of this Britannic specialty and was intrigued with the taste: spicy, salty, with hints of clove, nutmeg, and other scents of Noël time. The taste was unique in my experience. Good ham is the closest analogy but the beef taste, and “Christmas” spices more associated today with baking or confectionary, set it apart. It was both similar and dissimilar to Jewish corned beef when served cold. As the years went by these small shops disappeared. I read up on the dish, and Elizabeth David explained all one needs to know: origins, curing style, and detailed recipe. Spiced beef must be long-baked. Writes David, “On no account should anyone allow themselves to be persuaded that dry-spiced beef should be boiled or simmered on top of the stove”. Yes Madam. She advises sliced tomato and cucumber as an accompaniment, and especially, avocado salad. These all work perfectly, of course. 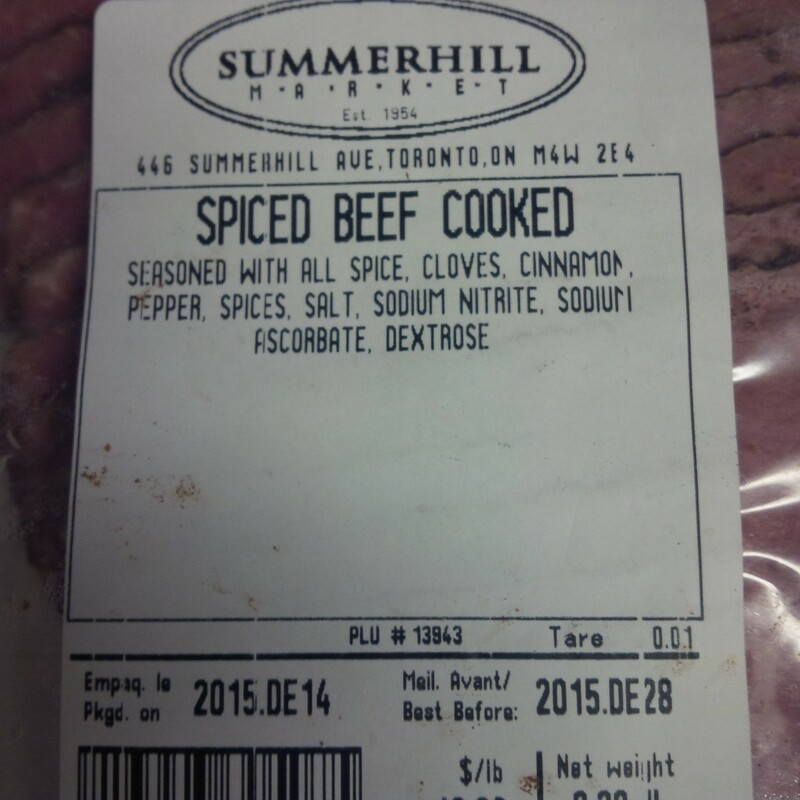 A couple of years ago when shopping in the plentiful larder that is the Summerhill Market in Rosedale, Toronto I spotted a small sign in the glassed deli counter, “Spiced beef, only at Christmas”. I thought, “That’s what the little stores on upper Yonge Street used to sell, what Elizabeth David memorialized in her wonderful book”. Summerhill Market clearly kept it going for some tenacious old customers, or maybe just from sheer habit. I bought some and it tasted excellent, similar to what David described. A few slices with good whole-grain bread, mustard, and a salad make a satisfying meal of an early winter evening. Add some sparkling wine or one of the old English beers such as Imperial stout, and you’re in clover, well, of a fashion. Few people anywhere in the world know what this dish really is, but the culinary-minded will do well to bone up. Vegetarians will have to read, if at all, purely for intellectual enjoyment. This is one carnivore’s specialty of which a veg imitation is impossible. Salt advisory: these old foods of the pre-refrigeration era used great deal of the sodium minerals to cure and preserve the dish. It’s not for those shy of the saline hit, accordingly. Still, just a few slices are needed and eaten with the vegetables and bread specified amount to a balanced diet, or so we think. I visited Goose Island years ago in Chicago not long after the place was starting to develop legs. I was there twice in fact. I never really liked the beers to be honest. 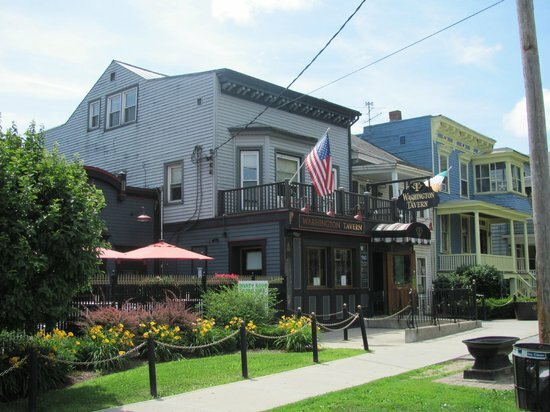 The brewpub was a fun place, large and with a good menu, but the beers seemed so-so to me. In particular, the famous IPA always seemed an odd bird with a “garden greenery” nose and taste that was not that attractive. In later years, I did try various GI beers when I could get them, and certainly the Bourbon County Stout made an impression although – not to sound ungrateful – I don’t think bourbon barrels suit strong stout or any beer. But that’s aside the point as the beer is a landmark in recent American brewing history, to be sure. 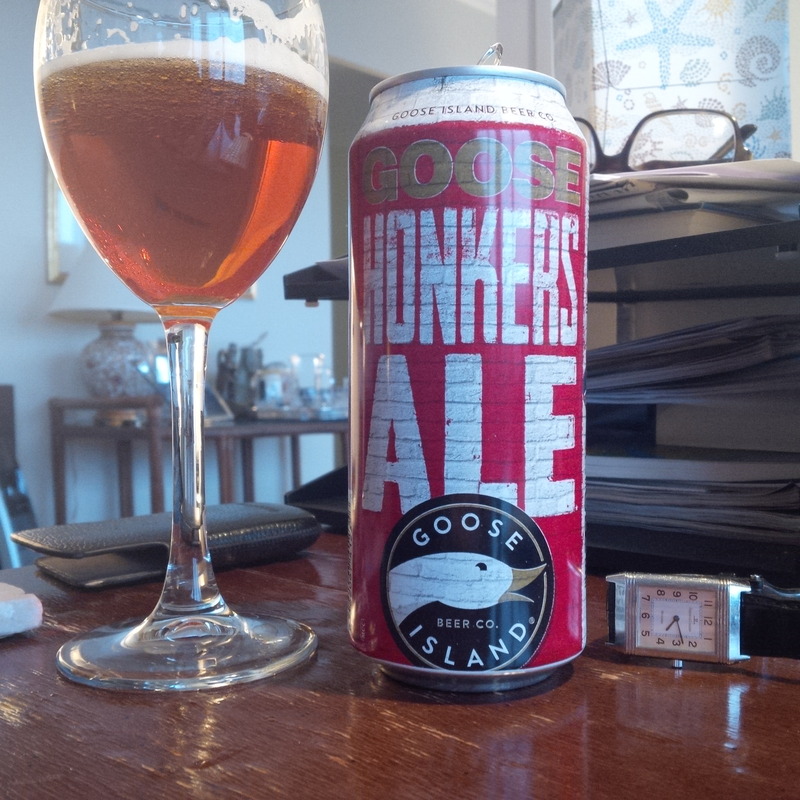 There was one beer I did like though, Honkers Ale, probably because it has an English-oriented palate. There are some English hops in the beer, particularly the aroma, and a good soft fruits quality which evokes a certain tradition in English brewing. It isn’t the best American ale certainly, but a sound choice for a tasty, solid beer or two. Its 4.3% ABV is a nice change from the usual higher gravities of American pale and India pale beers, as well. When GI’s IPA and Honkers became available here on draft a couple of years ago now, I believe they were imported from Chicago, or an American production locale at any rate. This draft was okay but I always like to try a beer in a can or bottle as one has the best chance to get it in optimal condition and without risk of unclean lines or other bad handling, which is more of a problem than many realize. As it was time, today I tried the canned version available at The Beer Store, which is brewed now at various Labatt plants in Canada including in London, ON. This arrangement follows the purchase of Goose Island by mega-brewer Anheuser Busch InBev a few years ago. The nose was fruity, almost like an Extra Special Bitter – well, Fuller’s – in England, but also say like Red Tail Ale of Mendocino Brewing or Red Hook‘s ESB or Audible Ale, which were influenced by English ale styles. There was a modest but welcome note of floral hops, I’d guess Golding, famous for hundreds of years as one of the premier ale hops. The taste was fairly full, bearing in mind too the 4.3% ABV, with a toffee-like note. It’s probably from caramel or crystal malt, a characteristic of the “bitter'” which lorded English town and dale until brewery consolidation reduced choice there and craft brewers started to introduce the American (citric) hop taste. (Good judges of beer in England tell me the old taste is far from history though, which is good to know). The can showed no oxidation whatever – no damp paper smell or acetic development. This is a testament to the skill of big brewery staff and impeccable brewhouse procedures. I’d guess the beer is pasteurized but can’t really tell – all to the good. The field is still open for a brewer in Canada or the U.S. to make a really English-tasting beer. I am sure a few exist here or there, but nothing widely available as far as I know. If Honkers had a stronger dose of those Goldings and used Fuggles or Target or another English hop as the bitterness backbone, it would be a stand out. 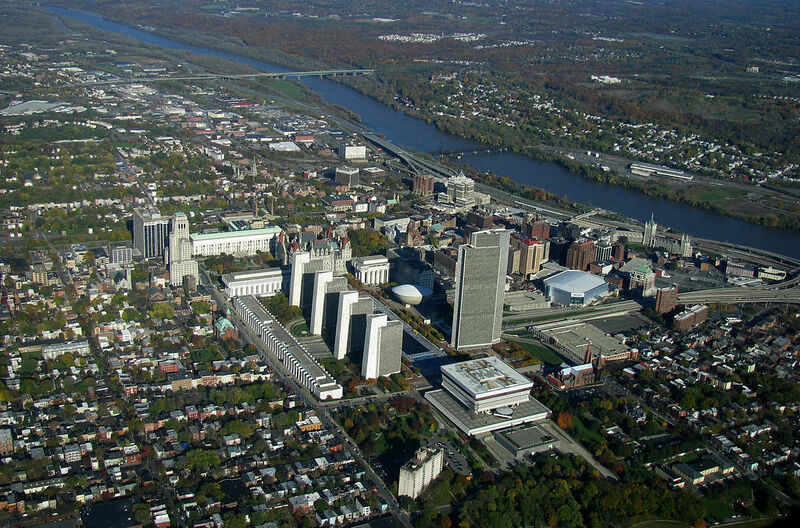 But then it wouldn’t be Honkers, and a lot of people like it, so Honkers should stay as it is, and someone should fill this gap. The true English flavour in top-fermented beer is unbeatable, but it has to be done right. The old Courage beers, e.g., Best Bitter or Directors, or the old Ruddles, would be a great place to start. (Image below is from Charles Wells’ website, here).